DISCLAIMER: As always, we post these opportunities as a courtesy for St. Edward’s University students. Note that their appearance here does not constitute any endorsement of the program by St. Edward’s. Appointments for Spring and Summer 2017! IBP’s mission is to increase diversity in the Science, Technology, Engineering and Mathematics (STEM) workforce. We design and implement strategies to increase access to STEM education, funding, and careers, with special emphasis on reaching underserved communities and diverse underrepresented groups. 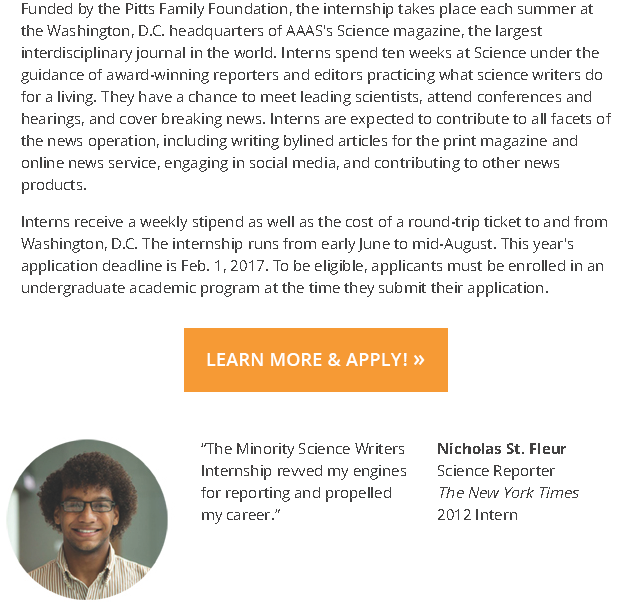 www.PathwaysToScience.org makes it easy for faculty and administrators to access resources that can assist them in their efforts to reduce barriers to participation, create environments rich in the positive factors that support student success on the STEM pathway, and conduct outreach to underserved communities and underrepresented groups by implementing recruitment and retention strategies that broaden participation and increase diversity. Potential majors: physics, chemistry, materials science, engineering (chemical, electrical, mechanical, metallurgical), applied math. 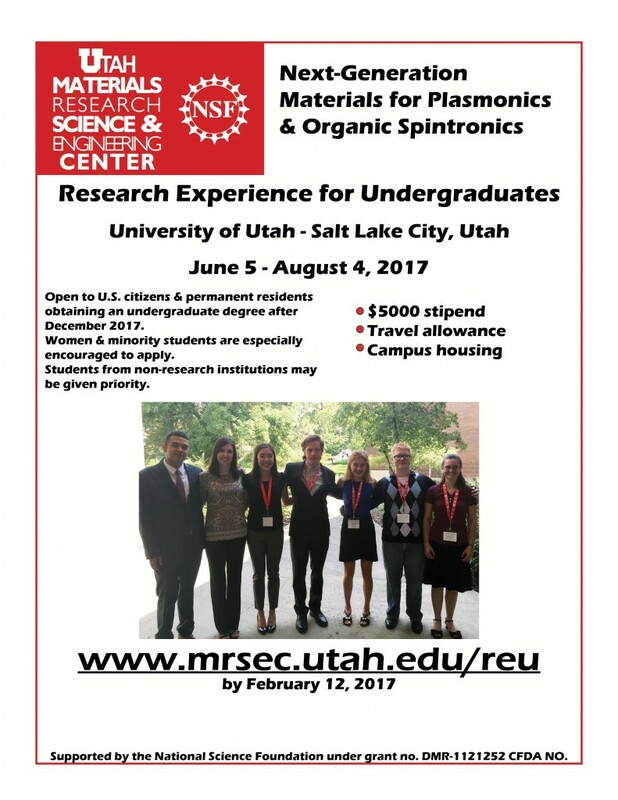 Open to U.S. citizens & permanent residents obtaining an undergraduate degree December 2017 or after. 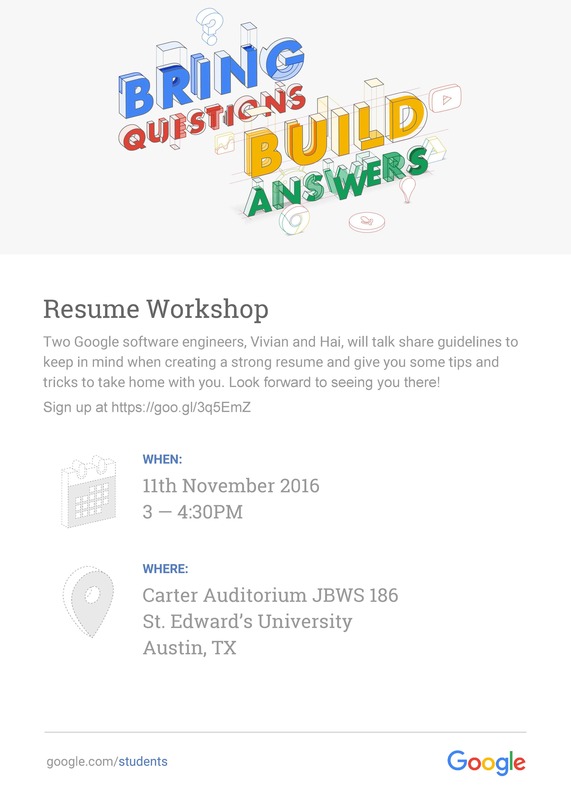 Note: The program described above is provided for your information only and its presence on our website does not imply any endorsement from St. Edward’s University. The Shared Studios Channel arrives in JBWS lobby. Stop by and “Take On Your World” by talking with someone at a similar Channel in countries around the world. The School of Natural Sciences will proudly host the Shared Studios Channel in the JBWS lobby for the next several months. 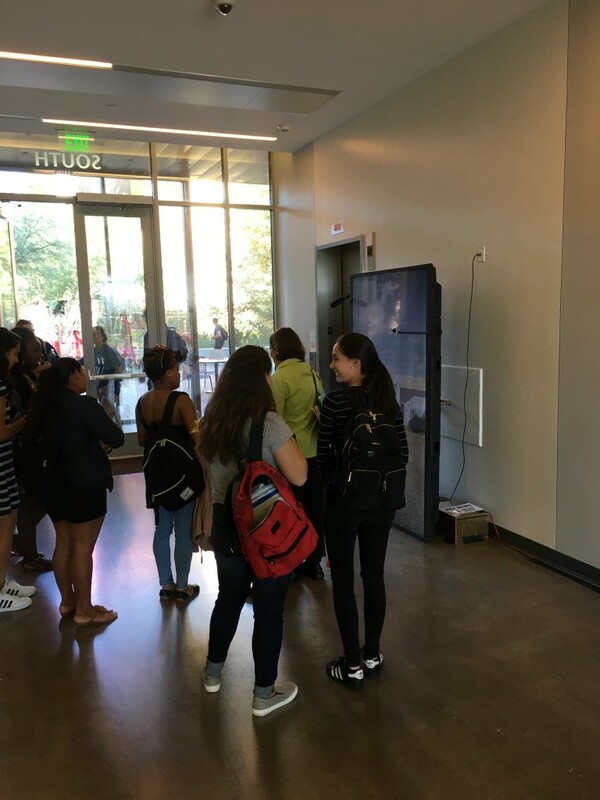 The Channel is the follow-on technology to the Portal (the gold shipping container that has been between Andre Hall and the Munday Library since late August) and will connect our lobby space with other such Channels around the world. We’ve already been linked to Afghanistan, where several students and I met a dental student who was up very late at night to chat with us! The Channel is a 90″ monitor with a webcam and microphone attached. We anticipate the Channel to be active for most of the day, but we are uncertain at present to where we will be linked. If a schedule becomes available, I will post that information here. The Office of Campus Safety will conduct a full system test of the SEU Alert system on Thursday, November 17th. This test will include the activation of the SMS text and email communication methods via TopperText. Please make sure your contact information is correct to ensure you receive messages during a campus emergency. Log into myHilltop and click the TopperText (Campus Emergency Notifications) button under Quick Links and follow the prompts. Contact us at campus.safety@stedwards.edu if you need further assistance. On Monday December 5, the Kozmetsky Center will feature a lecture offered by Dr. Dianne Barton who is currently responsible for managing water quality, environmental toxics, and regulatory processes at the Columbia River Inter-Tribal Fish Commission (CRITFC). Her lecture entitled “Native American Perspectives on Science, Spirituality, Nature, and the Environment” is scheduled for 12:00 noon – 1:00 PM in Mabee Ballroom A.
Dr. Barton helps restore fish in the ancestral homeland of the CRITFC tribes and also serves as Chair of the National Tribal Toxics Council (NTTC) which advocates for tribal interests in toxic policy decisions. Previously, Dr. Barton was a Distinguished Member of the Technical Staff at Sandia National Laboratories in Albuquerque, New Mexico. She holds a Ph.D. in Geochemistry from the University of Arizona. 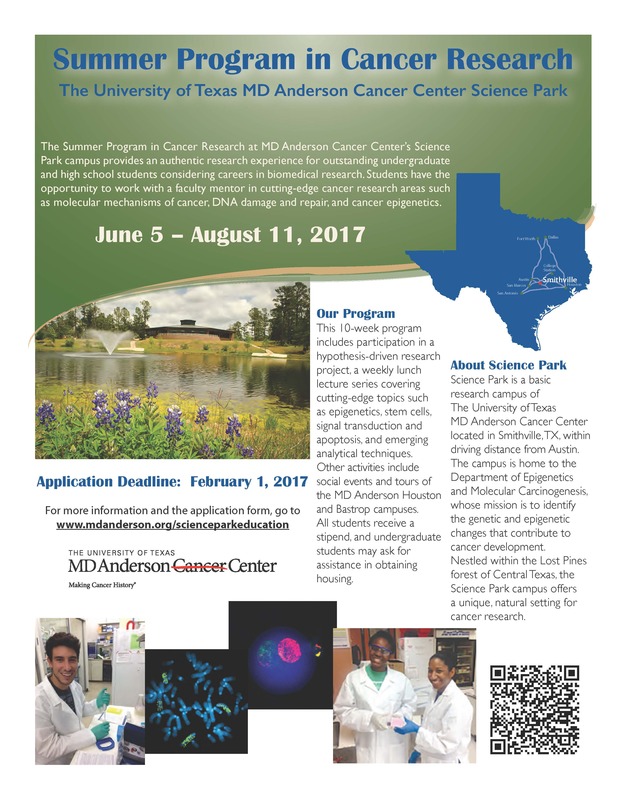 For over twenty-five years, The University of Texas MD Anderson Cancer Center Science Park has sponsored a Summer Program in Cancer Research (SPCR) for undergraduate students majoring in math or science. The program is designed to allow students to work on an independent, hypothesis-driven, research project in a biomedical research environment. For many interns, this experience is very helpful in making subsequent career choices. Please review the announcement flyer for the 2017 program. 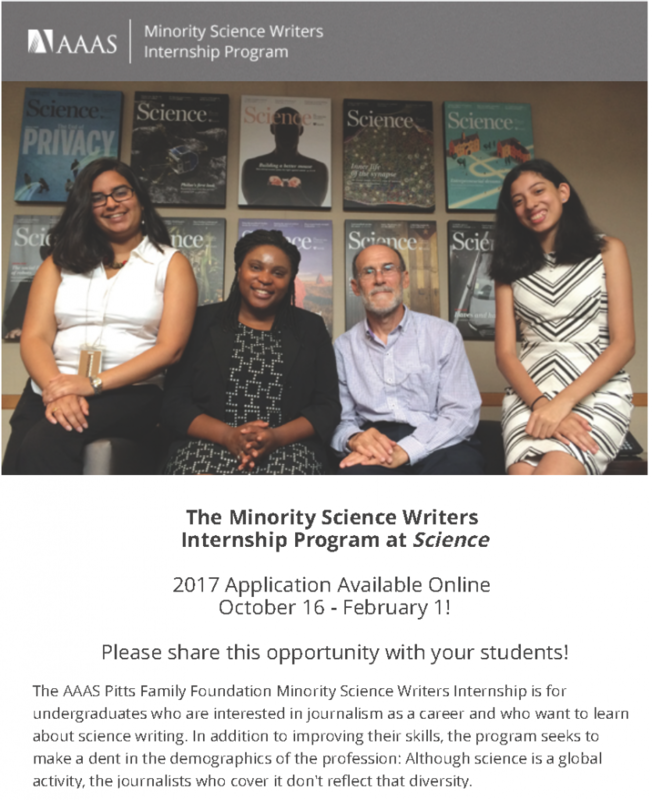 Minority students are encouraged to apply. Interested students can get more information and download the application on our website at http://www.mdanderson.org/scienceparkundergraduateresearch (scroll down to ‘Our Educational Programs’). Please note that the deadline for receipt of the completed application packet is February 1, 2017. The professional research staff includes junior and senior faculty, postdoctoral fellows, graduate students and research scientists. All members of the faculty are involved in education programs, which include training at the postgraduate, graduate, undergraduate and high school levels. Thank you for your assistance in publicizing our program. If you or an interested student have any questions or need more information, please feel free to contact me or Chris Contreras, Program Coordinator.